The Humboldt penguin is a South American penguin medium sized. Its name is a tribute to Alexander Von Humboldt, naturalist and explorer who described this penguin. In addition, the species lives along the coast bordered by Humboldt. It lives and breeds on the main rocky shores, cliffs and offshore in Peru and Chile, along the coast bordered by the cold Humboldt Current and does not migrate. The Humboldt penguin feeds on small fish, anchovies, squid and crustaceans.Ite dives to 60 meters deep and foraging among aquatic weeds. This species measuring between 65 and 70 cm and weighs between 4 and 5 kg. Its head, forehead, crown, nape, cheeks and the ear coverts are black. A white band joined the white breast on the sides. This line forms a distinct white eyebrow. The beak is thick, short and black, with a large area pinkish at the base and around the eyes, sometimes white for some individuals. The eyes are light brown. The powerful legs and webbed feet are black. They breed at any time of the year according to the food resources. It nests in colonies in burrows located in caves, crevices or holes in the rock, on the discoveries rocky shores. The burrow is cleared using fins and legs to push and remove sand. The penguin may also add stones and herbs. The female lays two eggs at intervals of two or three days. Incubation is shared by both parents for about 39 to 43 days. They take turns to go eat between each period. When the chick is born, one parent stays at the nest with it while the other fish. But when the young reaches two months, adults leave it alone during the day and fish together 35 km away from the nest site. The moult of the young penguin is between 70 and 90 days. At that time, the down is replaced by gray feathers, becoming darker day after day. This species may produce two broods per year. Both sexes are similar, the female is slightly smaller than the male. It reaches his sexual maturity at the age of two or three and its lifetime is estimated at 26 years. Humboldt penguins can not fly, but uses its relatively long flippers to “fly under the water just below the surface”. It is capable of reaching speed of 30 km per hour. He walks with webbed feet and tail. Couples use the same burrows year after year. 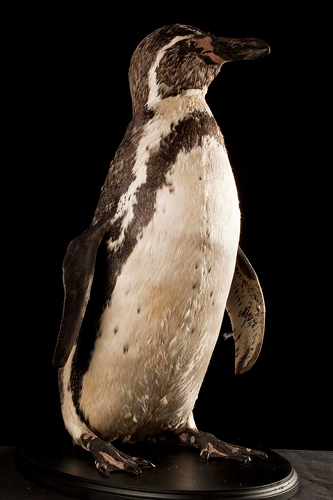 The Humboldt penguin is resident and performs only a few movements according to the food resources. Their natural predators are gulls, raptors, foxes and whales attacking youngs and adults. The Humboldt penguin populations are declining and classified as vulnerable.